The continued growth of innovation does not just rest on the shoulders of engineers and developers from the country’s top tech schools. With more industries increasingly relying on new software and systems, the breadth of the workforce likewise needs to be savvy in coding and other skills. That was the message at an event held Thursday at the General Assembly campus in New York. The results of a study, from Burning Glass Technologies and Capital One, were released highlighting the issue of low- and middle-income workers often not having the training to fill many tech-driven jobs that remain vacant. In response, Capital One and General Assembly joined forces to create the Capital One Opportunity Fellows Fund, which will aim to make education for careers in the digital economy more accessible to people across country from diverse, and often underserved, backgrounds. Over five years, $150 million in grants will be committed to community-based organizations to offer education to try to narrow the so-called digital divide, Capital One’s Carolyn Berkowitz said. That will include working with General Assembly and online education provider Grovo to create new ways to bring digital literacy to more people seeking jobs. Another aspect of the effort is to change companies’ attitudes about where worthwhile workers may come from. “Employers naturally go to the kid from Harvard just because he came from Harvard,” Berkowitz said. Talented workers with the digital skills can also come from coding boot camps, she said. The first 10 fellows of the program, who will have access to training resources at General Assembly, were also introduced. 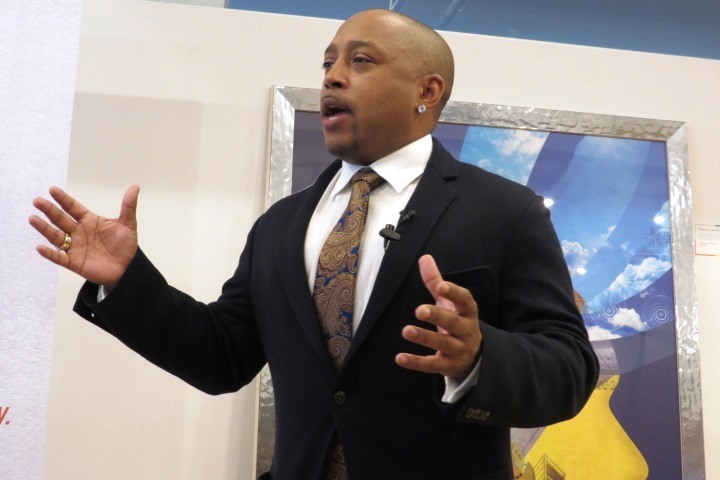 More people across different demographics need to cultivate opportunities in the innovation scene, said Daymond John, CEO and founder of New York-based apparel company FUBU. John, who also serves as judge on the TV show “Shark Tank,” was the featured speaker at the event and talked with me about how technology has changed his industry. Software and other digital tools have naturally made life more efficient in the apparel market. Digitally exchanging information about garments, for instance, has reduced the need to travel overseas to visit manufacturing facilities, John said. Old traditions of designers using a tape measure and other manual devices have also been replaced by digital tools, he said, with the exception of couture apparel. Further, it is easier for independent designers to get their creations in front of potential buyers thanks to sites such as Threadless, he said. The pervasiveness of technology speaks to the need for more people from diverse backgrounds to develop skills for the new economy. “When we look at Silicon Valley, half of 1 percent of people who get funded there are African-American,” John said. He attributed that in part to a lack of financial literacy and training in technology. “That creates more dividers away from the money, investments, or strategic partners,” John said.